Foldable to the most convenient size to store and travel. 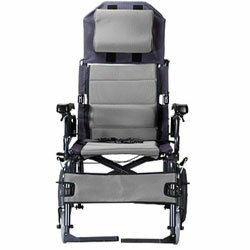 Tilt-in-space design helps reduce the chance of developing pressure ulcer. Removable armrest brings convenience to attendant. Assembly and disassembly without tools. The VIP 515 wheelchair is equipped with pneumatic tilt-in-space system, providing an excellent option for those who have higher potential of developing pressure ulcer. 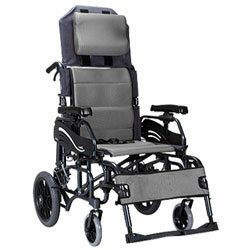 Attendant can easily tilt and recline the wheelchair from 0 to 35 degrees to change the user's position and relieve the pressure accumulated around buttocks area. In addition, to overcome the potential feeling of unsafe, the VIP515 is further equipped with an "intelligent and safe weight-shifting system” that automatically adjust for the center of gravity to achieve the steadiest position, preventing users from tip over. Thus, the tilt-in-space design is both safe and easy to control.